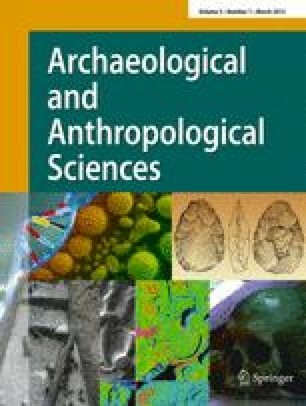 This study presents bone collagen carbon and nitrogen isotope data from the Migration Period cemeteries (fifth/sixth century AD) of Obermöllern and Rathewitz in Central Germany. The human average δ 13C ratios of −19.8 ± 0.3 ‰ and δ 15N ratios of 9.6 ± 0.9 ‰ (n = 43) reflect a mixed diet in a temperate C3-based ecosystem without significant difference between the two sites. The average offset between human and faunal δ 13C and δ 15N values indicates a significant contribution of plant food to the human diet that has different isotope ratios from the forage of the animals. It furthermore suggests the influence of land management on the δ 15N values. One adult male from Obermöllern stands out due to his elevated nitrogen isotope ratio, body height, grave goods, and burial position. The collagen isotope data of this study are comparable with data from other central European sites and confirm rather stable communities with moderate variation in the environmental conditions of arable land. We thank the State Office for Heritage Management and Archaeology/State Museum of Prehistory of Saxony-Anhalt, especially R. Mischker, for the access to the human skeletal remains. H.-J. Döhle made the faunal samples available and provided archaeozoological determinations. I. Rietig, W. Dindorf, and M. Müller helped substantially with sample preparation and isotope analysis and Uta von Freeden and Friedrich Lüth provided valuable archaeological information. We are grateful to Amy Bogaard and Lynn E. Fisher for the valuable comments on the manuscript. This research was supported by the German Ministry of Education and Science (projects 01 UA 0806A and 01 UA 0806B), which is gratefully acknowledged.